When I first saw Inner Me The Hectic Years Vitamin & Mineral Food Supplement, its as if they were made for me, as my life can get pretty chaotic with work and the kids, I'm always looking at ways to boost my energy levels and replace lost nutrients and in general make me feel better. 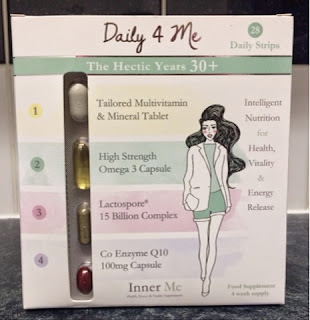 Inner Me has developed a range of daily 4 Me packs each pack contains a four week daily supplement of four tablets which will help replace and balance your needs as each one is tailored for the three stages of a woman's life; Teens & Twenties, Thirties & Forties and Fifties & Sixties, providing an advanced, convenient and all-in-one solution to a balanced, healthy lifestyle. It’s no secret women’s lives are becoming increasingly busy, whether it’s juggling work, family time, travel or socializing with the girls. However, to keep skin glowing, hair thick and strong and energy levels high, it’s vital to get a daily fix of vitamins and minerals, however busy you are. With this in mind, the luxury health, beauty and vitality supplement brand Inner Me has launched the country’s first vitamin subscription service, ensuring the ladies of this country need never go without their daily fix again. 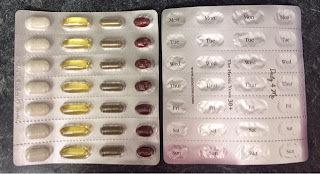 Bursting to the brim with tablets and capsules from Inner Me’s new Daily 4 Me range, the subscription process couldn't be easier – all you need to do is choose your favourite Little Box of Wellbeing, and a four week supply will be delivered direct to your door, beautifully gift wrapped with a special luxury beauty gift as part of the package. Whether it’s a present to that special lady in your life, or yourself, these fabulously feminine products will bring a touch of chicness to your dressing table. 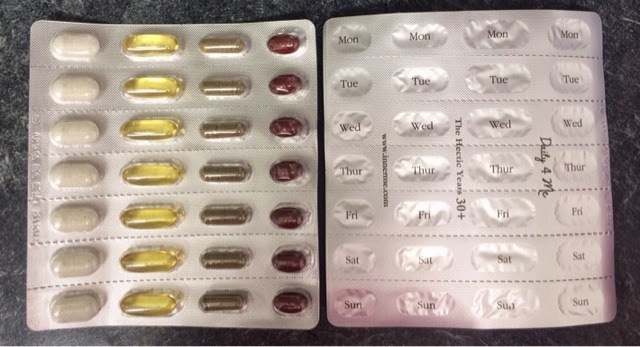 Not only does the subscription service ensure you need never run out of products again, but the launch of the Daily 4 Me also solves the problem of what vitamins to take according to your age range. Although we all know vitamins and supplements are perfect for giving us an extra health boost, different bodies have different needs, with the three products in the range tailored for distinct stages of a woman’s life. The Younger Years covers your teens and twenties, the Hectic Years looks after the thirties and fourties while the Fabulous Years takes care of the fifties and sixties. after all the early mornings and late nights – ensuring you look your best whatever the time of day! Daily 4 Me, The Hectic Years: Offers specially tailored ingredients to support women at one of the busiest times in their lives. Juggling kids and a career certainly leaves little time for yourself, which is why Inner Me has created four simple steps to provide you with all vitamin essentials to keep you in tip top health. The Hectic Years provide a range of essential micro nutrients including energy releasing B Vitamins and the very important Vitamin D, which keeps bones healthy. To ensure you keep your youthful appearance, the powerful antioxidant CoQ10 is included to fight nasty free radicals, which contributes to the ageing process, so your skin looks glowing and youthful. Daily 4 Me The Fabulous Years: Offers a comprehensive selection of essential nutrients to support a woman at an age when she has more time to feel fabulous – the fifties and sixties and beyond! Evening Primrose Oil is an effective anti-inflammatory and pain-relieving ingredient, which also reduces high cholesterol and menopause symptoms. Vitamin E maintains cell structure and keeps your body working in tip top shape! Inner Me is currently stocked at www.innerme.co.uk and nationwide at Holland & Barrett, Selfridges, Boots, Whole Foods Market, Love Lula.com, Feel Unique and John Bell and Croyden.